Thornbury Cottage in Kington Lane in Thornbury is an attractive property that presents a blank face to the world from the road but from other angles it is considerably more attractive. It has a long and interesting history. We have tried to trace details of some of the many people who have lived in this house. When Henry Weare came to the Manor Court in 1754 the cottage was described as in the occupation of Charles Morgan “since deceased.” We have not been able to trace a Charles Morgan who died in Thornbury in the first half of the eighteenth century. However it would seem that they were using an old legal format to describe the property as the same phrase was used in 1737 when George Wear the younger son of Henry and Ann Wear came to the Manor Court to claim his right to the property. The will of George Weare which was proved in 1754 refers to the fact that ‘Elizabeth Stokes or her under-tenants’ occupied what is now Thornbury Cottage. Elizabeth Stokes died 20th January 1754 aged 64. She was the widow of Thomas Stokes a mercer who died in April 1743 aged 62 years. The memorial to them in St Mary’s Church in Thornbury says their “only surviving issue” was Thomas Stokes Salmon, the second son of John and Ann Salmon. Ann Stokes the daughter of Elizabeth and Thomas was baptised in Thornbury on 6th August 1717 and she married John Salmon on 2nd February 1736. From at least 1780 to 1784 the Land Tax records for Kington show that John Carter was a tenant of Henry Weare. John Carter was also involved in the dispute of 1784 about the ownership of the properties. This is a common name and we cannot be sure of the identity of John Carter. However, there is a memorial in Thornbury Church that refers to John Carter a butcher who died 15th April 1810 aged 72 years, who could be the person in question. John was married to Sarah Bingham who died 31st January 1774 aged 41. Their daughter Sarah Carter was a niece of Henry Bingham and a property owner in Thornbury. In 1784 the cottage was said to to be in the occupation of William Taylor, a labourer. Sadly this too was a common name and we cannot definitely identify William Taylor. However it is possible that he was the William Taylor who was buried on 17th November 1799 aged 66. Kingsmill Grove’s will refers to the fact that Christian Clark a widow occupied the house. On 20th October 1812 Christian Clark made a will appointing her sister Mary Lucy of Thornbury as executor. The will says that Christian formerly lived in the parish of St James in the county of Gloucester. Christian’s property was in Bristol and consisted of four messuages with a malthouse, wainhouse and stable in Back Street in St Nicholas’s in Bristol. The properties were left first to Christian’s sister and then to her two daughters, Elizabeth Maria Shaw and Sarah Lucy. Christian Clark was buried in Thornbury on 31st January 1818 age 84. The will was proved on 17th March 1818 by her widowed sister Mary Lucy. Martha Thurston was the youngest of the twelve children of William and Margaret Grove. She was the sister and one of the beneficiaries of Kingsmill Grove. She was born on 28th September 1750. Her first husband was John Hodges. He may have been the John Hodges who died in Bristol on 31st May 1777 aged 45. Their son Thomas Hodges died as an infant and was buried on 20th August 1778. Martha’s second husband was Obed Thurston whom she married on 22nd March 1785. They had at least three children Maria born 11th April 1786, “Margarett” Thurston 20th February 1788 and Ursula Thurston who was born about 1790. Martha’s will also mentions her son John Thurston. Margaret Thurston married Thomas Gwynn on 3th May 1819. Ursula married William Grove of Bristol on 2nd August 1825 and died on 30th August 1826. Martha Thurston died and was buried on 1st November 1826 aged 77. William later became the landlord of the New Inn in Thornbury. Click here to read more about him. Richard Slade was a vicar of Thornbury. He had married Miss Bidlake Hiron of Great Torrington in 1798. Bidlake Slade died August 14th 1810. Richard had then married Joanna Robinson on 28th September 1812 in Thornbury. Joanna Robinson was the daughter of Colonel Beverley Robinson and his wife Susannah. Joanna was born September 22nd 1763. She came to Thornbury with her mother and sister after her father’s death in 1792. The three ladies lived in Fairfield House. 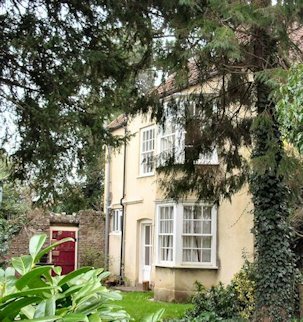 Presumably Joanna Slade had to leave the Vicarage after the death of her husband and we assume that she moved into Thornbury Cottage shortly after his death. We do not know when she left Thornbury but Joanna Slade died on 28th October 1832 in Bath at the home of her brother Sir W H Robinson. The Tithe Apportionment that accompanies the Tithe Map drawn up between 1837 and 1840 shows that James Virgo was living in Thornbury Cottage which was owned by John Key. The image below shows Thornbury Cottage and the other property owned by Sir John Key at that time, Thornbury House. James was the son of John and Sarah Virgo. He was born on 2nd October 1803 and baptised 3rd September 1806. He married Elizabeth Higgins on 19th November 1825 at Thornbury. Their son Charles Virgo baptised 18th December 1826. The register shows that James Virgo was a carpenter. Their daughter Frances Virgo baptised in 1828. We do not know when James Virgo’s occupation became an auctioneer rather than a carpenter. He was shown as an auctioneer in the 1841 census and the first advertisement for James Virgo as an auctioneer in the Bristol Mercury appears to be in August 1842. The 1841 census also shows that Eliza Virgo, the wife of James, was aged 45 and James himself was then 37. They had two children, Charles then aged 14 and Frances aged 12. James’s sister Elizabeth Virgo married Joseph Collings the watch maker. The 1851 census shows that James Virgo was living with his wife Elizabeth aged 38 and daughter Frances aged 21. By 1856 we know from the Trade Directories that the Virgo family had moved to The Close House (now 42 High Street). James’s wife, Elizabeth Virgo died January 16th 1861. By 1861 the census shows that James Virgo was in the Close House, which he seems to share with Mary Macdonnell. He was a widower and auctioneer. His daughter Frances was living with him. He had a visitor there called Hannah Maria Williams from Tredegar aged 17. James’s daughter Frances Virgo married Robert Hughes in 1866. By 1869 James had moved to the house which later became known as 55 High Street. The 1871 Census shows that he was still living there and was sharing the house with his daughter, Frances Hughes and her son, Robert Virgo Hughes aged 1. In the 1881 census he was still sharing the same house with Frances and Robert. On January 9th 1885 an article appeared in The Bristol Mercury with an account of James Virgo’s death. It said that Mr Virgo died suddenly at his residence the previous morning about 11am aged 83 years. It said that for a great number of years James had carried on the business of auctioneer. His daughter Mrs Hughes resided with him and a little after mid-day Mr George Krell called at the house on business. There was no answer and, knowing Mrs Hughes was away from home, he went to the back of the house. Through the window he could see Mr Virgo lying on the floor. He and PC Eyles entered the house and found Mr Virgo unconscious. A Bristol Mercury article of 2nd October 1858 said Sir John Key owned the property that became Thornbury Cottage which had been empty for some years. The report said on 21st December 1857 an excise officer J. W. Dalby took possession of the cottage. This is how the battle for the church pew began. Read more about John Watson Dalby. rented Thornbury Cottage by the 1867 rate book. In 1868 the Bristol Mercury advertised the sale of a messuage with four bedrooms and walled garden then in the occupation of Miss Laver at a rent of £20 a year and another cottage in the occupation of Joseph Pym at a rent of £8 a year. Both were owned by Kingsmill Grove Key. The cottage was said to be open to land also owned by Kingsmill Grove Key but rented out to Mr Walker. T he newspaper said that the property had a parlour, dining room, drawing room four bedrooms and an attic as well as the kitchen and usual offices. Maria Louisa Laver was born on 17th May 1820. She was the daughter of the bank manager Joseph Laver and his wife Louisa. In the 1851 census Maria was living with her parents in the High Street in Thornbury. Joseph Laver’s will of 1856 left Bank Cottage where he was then living and its contents to his daughter Maria. On 6th June 1858 there was an announcement that Maria Laver was the owner of household effects including ” a good cricket tent” that were to be auctioned. These goods were presumably those of her late father. The Trade Directories show that Maria Louisa Laver ran a ladies’ boarding school in 1877 at Thornbury Cottage on the corner of Kington Lane. We understand from the Society of Thornbury Folk that she kept a school there for many years. We have records of her in the Rate Books 1869-1885 which show that she rented this property from Sir K G Key. In 1882 Charles Liddiatt who was twelve years of age was charged with stealing threepence which belonged to his employer, Miss Laver. He had been convicted of stealing from her only ten days before but she took him back into her employ. For this second offence he was sent to gaol for one month with hard labour and twelve strokes of the birch. In 1890 Maria was renting 24 Castle Street from Francis Gayner. The 1899 rate book shows that Maria was then living at what is now Bank Cottage (14 Castle Street in Thornbury) which she rented from John Crowther Gwynn. Maria Louisa Laver died on 6th January 1900 and was buried with her parents. The report of her sister Charlotte’s death makes mention that Miss Laver (Maria Louisa) was also lying dead at the time that her sister died. James rented what appears to be Thornbury Cottage in 1889. The 1891 Census shows that he was then aged 27 and an auctioneer and land agent who was born in Chelmsford in Essex. His wife Gwenllian was aged 23 and she was from the Rhondda. They had a son Alan Rowley Pertwee aged only one year who was born in Thornbury. They employed a 24 year old general servant. James Alfred and Gwenllian had married in Cardiff in 1889. While he lived in Thornbury the Trade Directory showed that he was also a Lieutenant in the Gloucester Regiment 1st Volunteer Battalion. The battalion drilled at the tennis court in Thornbury Castle. He traded in Thornbury as Messrs Luce and Pertwee. By 1901 they had moved to Roath in East Cardiff. The 1901 census shows them living there alone with their servant. The London Gazette of 22nd May 1925 gave notice of the death of James Alfred Thomas Pertwee late of 4 Oakfield Street in Cardiff and advertised for people who had any claims on his estate. James was then said to be a member of the firm of S Hern and Pertwee of 93 St Mary Street in Cardiff. Alan Pertwee their son married in 1928 in Cardiff and died in 1962 in Devon. Gwenllian died in Newton Abbott aged 97 on 4th October 1965. She was buried in Moretonhampstead. Julia rented the house from Kingsmill Grove Key from at least 1895. The Trade Directory refers to Mrs and Miss Oakes and it appears that Mrs Oakes had a daughter living with her. We believe that “Miss Oakes” was Amy Coleridge Oakes who married Durrant Henry Cooper a solicitor from Brighton on 5th June 1895 in St Mary’s Church in Thornbury. Amy, then aged 21 was said to be the daughter of Lieutenant Colonel Henry Ferdinand Oakes. This image below is said to be of Amy Coleridge Oakes. We understand that she is the lady in the back row on the left. Henry Ferdinand Oakes married Julia Coleridge in the December quarter of 1872 in Brentford. Julia Coleridge had been born in Aden. In 1875 on April 8th Mabel, the daughter of Henry Ferdinand and Julia, was born in Brighton and baptised in Southall Middlesex. On 12th March 1876 a son Richard was born in Torquay. They had another daughter Edith Mary Oakes born in Germany. Henry Ferdinand Oakes had died on 22nd February 1884 at Ingleside, St Martin’s in Jersey. He was only 44 years old. 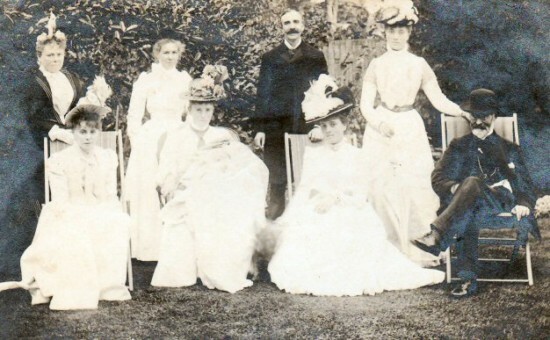 In 1891 Julia aged 17 Mabel aged 16 and Francis Edith aged 14 were living with their widowed mother Julia Oakes at the home of their grandmother Emily Coleridge in Hove in Sussex. Emily was also a widow and had been born in Thornbury. The Thornbury connection seems to have brought Julia and her daughter to live in Thornbury Cottage by 1895. In the 1901 Census the widowed Julia was staying with her daughter Edith Cole and Edith’s husband Charles in Hove. Charles Cole was a solicitor. By 1905 the rate book shows that Thornbury Cottage was empty. In some records John appears as Joseph John Cross. We believe that for a period between 1905 and 1910 John Joseph Cross occupied Thornbury Cottage as a tenant of Hon Geraldine Mundy. Born on 23rd February 1849, Merriott, Somerset, John Joseph Cross and his older brother Francis Richardson Cross were sons of Joseph Cross a Vicar of Merriott in Somerset and his wife Caroline. The 1851 census shows that they were living in the Vicarage at Merriott at that time. Their father, Joseph was a vicar there between 1832 and 1855. John Joseph Cross became Master of Newton Abbott School, where he worked for thirty years. He played twice for Gloucestershire at cricket in 1870. He married Helen Philippa George in 1898 in Westbury on Trym. The 1901 census shows that he was still a schoolmaster in Newton Abbott where he lived with his wife Helen. In 1910 the name of John Joseph Cross was crossed through as an occupant of Thornbury Cottage which would indicate that he had left the cottage. However the 1910 electoral roll still shows that he lived at Thornbury Cottage. In the 1911 census although Thornbury Cottage appears to be still his home the Census shows the house only had Laura Milsom a servant was living there at that time. A note on the entry says “family away from home”. In fact he appears to be in Alveston, with his brother Francis and sister in law Eva Beatrice. John Joseph Cross, then living at 7 Beaufort East in Bath, died on 2nd November 1918. His will was proved by his widow Helen and his brother Francis. Francis according to Clifton Rugby Club History website was born 26th November 1847 at Merriott. He was educated at Crewkerne Grammar School and King’s College London. He was associated with Lord Lister. In 1878 he left London and was elected assistant surgeon to the Bristol Royal Infirmary. He played for the first Clifton Rugby Club which was founded in 1869. He was very interested in medical education and became Dean of the Medical Faulty of Bristol university. He married Eva Beatrice Hawkes in Newton Abbott in the September quarter of 1889. He was also very active in a variety of charities and was President of the Grateful Society in 1889. The 1891 census shows that he was an ophthalmic surgeon aged 43 and that his wife Eva was 29. The couple lived at Chandos Villa Richmond Park Road in Clifton. The history of the Bristol Eye Hospital makes it clear that Francis Richardson Cross made a very important contribution to the expansion of the hospital from its humble beginnings in 1839 when it was purchased from the Blind Asylum. The hospital was becoming too small and a then newly appointed surgeon, Mr Francis Richardson Cross, convinced the hospital committee of the need to expand, so the adjacent houses were purchased. Francis Cross was Sherriff of Bristol in 1897. In the 1901 census he and his wife Eva Beatrice and their three daughters lived at Worcester House Worcester Terrace in Clifton. The 1909 Prewett’s directory shows that he was living at Thornbury Cottage in Kington Road. The 1911 census shows that Francis and Eva had moved to Alveston. Francis was then aged 58 and a Surgeon and Oculist. They had three daughters living with them who were all born in Clifton; Frances aged 20, Marion aged 16 and Betty aged 12. As well as Francis’s brother Joseph the household included their sister Caroline then aged 50 and three domestic servants. Eva died in Thornbury on 27th December 1920. Francis died on 12th July 1931 at his home Worcester House in Clifton after a bout of influenza aged 78. He was buried at Alveston. By 1916 the Prewett’s Trade Directory shows that Mrs Stockley lived at Thornbury Cottage. She was the wife of General Arthur Uniake Stockley and the daughter of Henry Craven St John. Arthur Uniacke Stockley Brigadier-General CRA, CMG of Wellington College, RMC at Woolwich and Royal Horse and Royal Field Artillery was the elder son of Colonel George Watts Stockley RE. He was born in Nova Scotia. He was commissioned in the Royal Artillery on 15 February 1889. His pre-war military career was fairly uneventful, spent mostly in India and with the Volunteers and Territorials. He married Eleanor Dora St John on 3rd January 1899 at St Mary’s Church. He commanded 4th (Northumberland) Brigade RFA TF from 23rd September 1912 to 28th July 1914 and when war broke out he mobilised with the 50th (Northumbrian) Division. The 1901 census shows that they were then living in Monmouthshire House in Usk. He was then aged 32 and a Captain in the Royal Artillery. Eleanor was aged 26. Arthur was CRA of the Division from 20th June 1916 to 29th March 1918, when he was invalided home. He was three times mentioned in despatches. He retired in 1919 and became much involved with the British Legion in Essex. He was the elder brother of Brigadier-General E N Stockley RE. Presumably Eleanor Stockley was living near her family while her husband was away at war. When Arthur was discharged from the army he seems to have gone to live in Essex. We assume that was where Eleanor was also living. Arthur died in Sturminster Newton in Dorset in October 1939 and left his estate of £229 2s 6d to his widow Eleanor. By the 1918 electoral roll Annis Mackie was living in Thornbury Cottage. In 1925 and 1926 the records show that Annis Mackie rented the house from Mrs Gillett. The Trade Directories suggest a person called “Miss Mackie” lived there from 1927 to 1935. In 1946 the electoral roll shows her name as Christiana Mackie. We were only able to trace the outlines of the lives of Annis Mackie and her daughter Christiana. However a nephew of Christiana, called Professor George Owen Mackie, a fellow of the Royal Society, a musician and a potter recorded the history of his fascinating family on a website called Mackie Men and the Empire. The photo of Christiana and her donkey on the right appears on that website. With the help of this website, we have learned much more of Annis Mackie nee Bennett who was born on 13th January 1841. The 1851 census shows her at the family home Norton’s Farm in Henbury. Her parents were George and Elizabeth Bennett. George was quite a prosperous farmer and had 200 acres. We understand from George Mackie’s website that Annis went to boarding school at age nine. Annis’s life changed in 1851 when her father died, apparently of apoplexy. Annis’s widowed mother and her family went to live in Stone near Berkeley. The 1861 Census shows the widowed Elizabeth then aged 61 with two of her daughters, Annis aged 20 and 16 year old Emily. They appear to have called the house Norton House after the farm because it is so called in the 1871 census. Here Elizabeth is described as a landowner. George Mackie says that the Bennetts had to employ a bailiff who ran the farm during the illness of Annis’s father George Bennett and perhaps his widow continued to own the farm. Annis was 30 in the 1871 census but we understand from George Mackie that she had already met her future husband John Mackie who was a chaplain at Bristol Royal Infirmary. Annis had gone there to pay her annual subscription. The couple married on September 26th 1871. John Mackie was a widower aged 45 according to George Mackie and he already had seven children. It seems that Annis’s money helped to buy a living for John Mackie and he became Rector of Filton. Christiana Grace Mackie was born in October 1873. In the 1881 census they were living in the Rectory at Filton. John was aged 56. He and Annis had four children at home with them. Ellis a son by his earlier marriage was aged 21, Christiana was aged seven Frederick was aged five and Agustine one. Another brother of Christiana’s Hugh de Fylton was born in 1882. In 1901 aged 27 Christiana was living with her father John then aged 76 (and still apparently a clergyman) and her mother Annis aged 60 at the Rectory in Filton. Her brother Agustine aged 21 also lived with them. 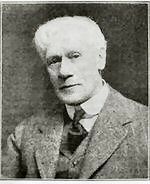 John Mackie died in the March quarter of 1902. Annis and Christiana moved to live in Compton Greenfield according to George Mackie. In 1916 however we understand that the house was requisitioned for a munitions factory and they were forced to move. The 1911 census however indicates that Christiana’s brother Hugh de Fylton Mackie was already living in Thornbury with his sister, while their mother Annis was living in Northleach in Gloucestershire. The two ladies certainly seemed to live in Thornbury Cottage by 1916. They appeared to remain there for the rest of their lives. Annis Mackie died in Thornbury in 1927 aged 86. 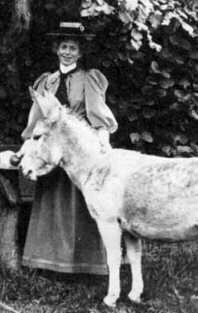 The photograph on the right above is of Annis’s daughter, Christiana and her donkey called Jane (or Jerry). It was taken about 1898 and so long before she moved to Thornbury Cottage. Christiana’s life may appear narrow and limited – the spinster daughter of a Rector living in a small market town. However George Mackie’s work shows that this was not the case. She was humorous and well read. She travelled to stay with her brother Gascoigne in Saint Jean de Luz in South West France. Christiana was mentioned fondly in the reminiscences of Peggy Spencer Palmer, the daughter of the local chemist James Spencer Palmer. Peggy recalled that Christiana had friendships with the distinguished musician Basil Harwood and Margaret Frost the daughter of a Bristol art dealer, both of whom were introduced to Peggy. Christiana was even a “scout master” according to Prewett’s Directory of 1916 and by 1939 the trade directory describes her a a J.P.
Christiana died aged 73 on 23rd August 1953. The report of her death in The Times said that Christiana Mackie JP of the Cottage in Thornbury died aged 79 and that her funeral was held on August 27th at Thornbury Church. In 1958, 1961 and 1965 the electoral roll shows that Anne and Patrick Setchell lived at Thornbury Cottage. Patrick William Setchell was a solicitor with Crossmans at 12 The Plain from 1971 to 1978. Patrick William Setchell was born in Bristol on 12th September 1908. Patrick married Ann Foyster in 1956. Ann was born in May 1935. Their daughter Jane was born in 1959 at Almondsbury Hospital. Patrick died in Bristol in May 1988 aged 79. Ann Christie Setchell later lived at 21 Pullins Green until 1990. She died in October 2001.